Charlotte's CoolSculpting Experts - Freeze Your Fat! DLVSC was the very first practice to bring CoolSculpting to Charlotte, NC & the surrounding areas in 2009. Furthermore, we’re one of only a few practices in Charlotte to offer DualSculpting, meaning we can treat two areas at the same time! Our physicians have participated in clinical research & aided in the development of new treatments using this revolutionary device! Even more importantly, we always offer the very latest in CoolSculpting advancements. We have the redesigned CoolAdvantage applicator at DLVSC, cutting treatment times nearly in half to just 35 minutes per area (also less risk of bruising, less discomfort & better results)! What is CoolSculpting? How does it work? CoolSculpting is a non-invasive, FDA approved cryolipolysis (fat freezing) device that we use for removing fat in select areas. The idea for this procedure was born when Harvard researchers discovered that fat cells are vulnerable to freezing temperatures. Further research proved that fat could be safely targeted & frozen without causing any harm to adjacent skin, eventually leading to the development of the technology we know & love today! To explain, 20 to 30% of fat cells in the treatment area are crystallized (frozen) & destroyed. Afterwards, your body processes these dead fat cells and eliminates them naturally. Of course, once the treated fat is gone, it’s gone for good! CoolSculpting is without a doubt best for someone who already maintains a healthy lifestyle but is struggling with fat loss in specific stubborn areas. Also, it’s a great option for someone who wants to avoid surgical procedures or who would like a touch-up to a previous surgery, for example after liposuction. To clarify, CoolSculpting is not a major weight loss treatment. First of all, we’ll start by taking photos & then marking the treatment area. Next, warm gel and the CoolSculpting applicator is put into place and your treatment cycle begins! Sometimes a stinging sensation is felt when the cycle starts, but it quickly fades. During treatment most people read, watch TV, or take a nap! Each cycle lasts 35 to 45 minutes. What are the side effects of CoolSculpting? Any downtime? To be sure, almost all patients do experience some degree of redness, aching, numbness or mild swelling. However, these side effects are manageable and almost always resolve after about 3 to 7 days. Also, bruising is possible, but is much less common. Nevertheless, this is a non-surgical procedure, so you can go back to daily routines with no downtime. How soon does it work? 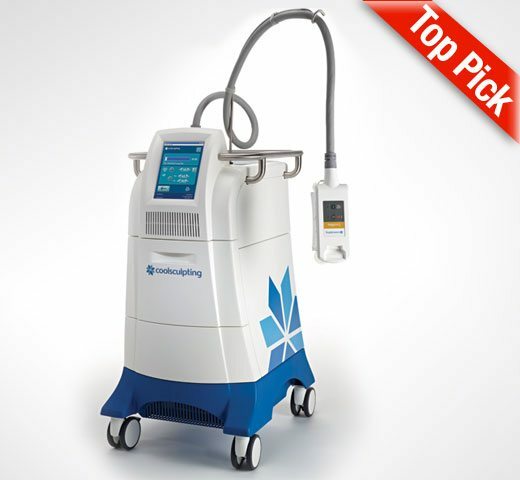 How long do CoolSculpting results last? Sometimes results are seen as early as 3 weeks post treatment, but improvements will continue for 3 to 6 months following the procedure. Results are long-lasting because the treated fat cells are permanently destroyed and they don’t regenerate. Furthermore, we can treat the same area again for even more fat loss! However, having the CoolSculpting procedure done does not mean you will never gain weight in the targeted area again, so healthy lifestyle maintenance is key. Fat loss the “old-fashioned way” doesn’t actually cause us to lose fat. That is to say, our fat cells just shrink. Likewise, when we gain weight, our fat cells don’t multiply – instead, they just expand. In contrast, with CoolSculpting, treated fat cells are destroyed and we do lose them! In fact, patients can expect about a 20 to 30% fat reduction in the targeted area with each session. If you gain weight after the procedure, the untreated fat cells can indeed still expand, as can fat cells in other areas of your body. Since there will be less fat cells in the specific treatment area after CoolSculpting, you may notice that you put on a bit more weight somewhere else.